I must admit, these cookies were originally intended for a birthday celebration, not Easter. However, the adorable swirl and colours reminded me of Easter eggs, so I thought this would be the perfect Easter post. Originally a christmas cookie recipe, I swapped the colours for pink, yellow and blue, so feel free to adapt the colour scheme to any occasion your celebrating. Whisk the flour, baking powder and salt in a medium bowl. Beat the butter and granulated sugar in a large bowl with a mixer on medium-high speed until light and fluffy, about 3 minutes. Add the egg and vanilla extract and beat until combined. Reduce the mixer speed to low and beat in the flour mixture, then increase the speed to medium high and beat until well combined. Divide the dough into 3 pieces. Return 1 piece to the bowl; beat in the pink food coloring with the mixer until the color is fully incorporated. 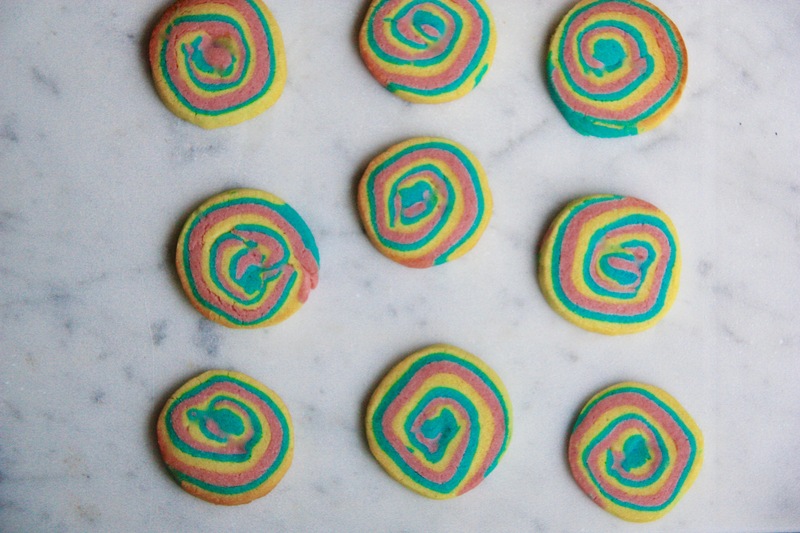 Beat the yellow food coloring into another piece of dough. Beat the blue food colouring into the last piece of dough. Place each piece of dough on a separate sheet of plastic wrap and pat into a 4-inch square. Wrap and refrigerate until firm, at least 1 hour. Carefully remove the top piece of parchment from each piece of dough. Flip the blue dough on top of the pink dough; remove the parchment. Flip the yellow dough on top of the pink dough; remove the parchment. Cut the stack in half crosswise. Roll up each half lengthwise into a tight log, using the parchment to help you. Transfer to a baking sheet, cover loosely with plastic wrap and refrigerate until firm, at least 1 hour.